OK so right now I should be breathing into a paper sack. 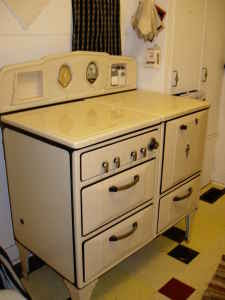 I'm about to hyperventilate because I just saw the most beautiful vintage stove on Craigslist, and I WANT it!!!!! I emailed the poster nearly an hour ago and they have not emailed me back yet. Oh I know it's not even an hour yet..... but I love the stove!! I hope it's not some sort of crime to copy the photo of said stove but here it is, isn't it glorious???? I know if this one doesn't work out for me there will be a different one, but oooooo it's sooooo pretty!!!!! It might actually be a good thing if I don't hear back as I will be forced to choose between the stove and the weatherstripping for the car. Oh choices can be so overwhelming!!!!! My friend just had to sell her vintage pink stove and she is in FULL pout mode about it poor thing. Thanks for the comment on my blog about my son. That was really nice of you! I had a similar one years ago (I actually still have it but it isn't hooked up anymore) It was fun to cook on. I love the panels that cover the burners. That way your stove always looks clean. OMG - truly glorious. Isn't it funny the things we get excited about? My engine and your vintage stove. i have a very similiar stove..
its at my moms until we buy our house.. so I am counting down the days till I get to plug that bad boy in! mine is a gas stove from the 40s. it was my great grandmas! Frugal Friday - Because Frugal is the new Black.